We have a favorite woman customer who always has us make Valentine flower arrangements for her CPA husband every year and she has us theme them to something meaningful in his life. We’ve featured aviation, golf, UCLA, the stock market, and Hawaii. 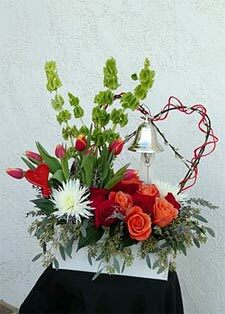 This year her request was to feature a bell in the arrangement. Our client shared that her husband was thrilled and delighted to be able to “ring the bell” in a medical clinic upon completion of his radiation treatments for an aggressive skin cancer. Upon delivery he got a kick out of ringing the bell once again! As part of CSUN's 60th Anniversary Reunion weekend in October 2018, the Soraya (formerly the Valley Performing Arts Center) hosted a concert featuring Monica Mancini, the daughter of Henry Mancini. Monica grew up in Northridge very near the CSUN campus during the time her father wrote Moon River. Blossoms by Cherry was asked to do the centerpieces for the tables for the special donors who were seated in the elevated orchestra pit area. They were treated to wines, special appetizers and desserts. The request was for contemporary florals incorporating succulents and bright colors that would stand up to the stage lighting but were low enough not to interfere with views. It was a fun challenge. The containers were low cement boxes and flowers in various colors of lavender and purple. 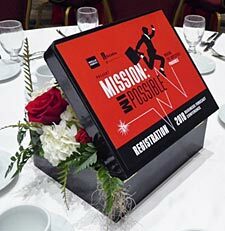 At a recent Valley Industry and Commerce Association (VICA) day-long forecast conference at the Hilton Universal, the theme was "Mission Possible." The focus for everyone attending this event's luncheon was on keynote speaker Los Angeles Mayor Eric Garcetti. However Blossoms by Cherry was hoping they were also noticing the flower arrangements on the tables and dais. Blossoms by Cherry was tasked with providing the florals to enhance this catchy theme. Small black suitcases were used as centerpiece containers and were filled with red and white flowers with the event's logo placed the lid. Smaller coordinating florals were on the dais where Mayor Garcetti gave his view and predictions for Los Angeles businesses. We were very proud to have been selected to provide flowers for this important annual event. The morning of delivery for the centerpieces for the annual fundraising dinner for the Boys and Girls Club, Blossoms by Cherry received a call that the event was cancelled due to the fires raging in Malibu, Agoura Hills and Bell Canyon. People simply could not get to the Warner Center Marriott for the event or wanted to stay home "just in case." We already had our truck loaded so took the florals to the Boys and Girls Club for them to give away as they saw fit. 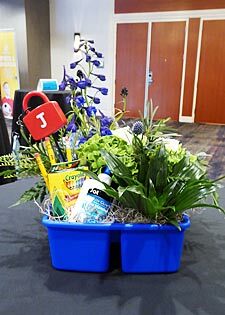 We were very disappointed because the "Unlocking Doors for Kids" theme was cleverly represented by a kid's educational game lock and key as a pick coming out of a bright blue art tote with one side filled with crayons, glue, pencils and a small plant with the other side with flowers in their colors of blue and white. The idea was for guests to donate the centerpieces back so the Boys and Girls Club could take advantage of the totes and art supplies. PS - the event was rescheduled two months later and the centerpieces were a big hit. 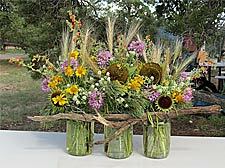 We have been getting many requests from our customers for us to provide centerpieces or arrangements that can last longer than the typical seven to ten days for fresh cut floral arrangements. Our customers desired outstanding and attractive décor that could meet their needs for entertaining multiple times during a season. 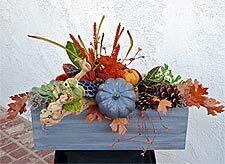 We designed this Thanksgiving arrangement which features live potted plants, succulents and attractive dried fall materials. All that was required of the customer was gentle watering of the live plants every so often. Blossoms by Cherry has also created similar arrangements with a live orchid as the focal point with plants and seasonal items being incorporated. Nothing quite replaces the amazing beauty of fresh cut flowers but this solution requires minimal care and lasts through a holiday season. For the eighth consecutive year, the readers of the Los Angeles Daily News selected Blossoms by Cherry as the Best Florist. Voting took place during the month of July when readers were asked to mark their ballots for their favorite San Fernando Valley vendors. Cherry Henricks, owner of Blossoms by Cherry, said after being told the results: "I am so humbled by the special people throughout the valley who Voted for my company, not once, but now eight times! It makes me want to work even harder to challenge my creativity and increase my services in order to prove that their votes were well deserved." Cherry Henricks has received a Volunteer Service Award from CSUN at a luncheon held at the Hilton in Woodland Hills. Volunteers were honored for their individual contributions across a wide range of volunteer opportunities on campus. Cherry was recognized for her work with the President's Associates, an annual giving donor group. She has focused on ways to bring together the Northridge Chamber of Commerce with CSUN, allowing the local business community to learn more about CSUN and its many offerings and services for local businesses, many of which are free. 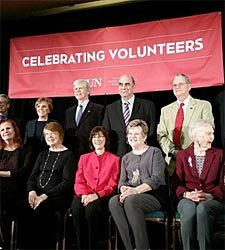 Cherry is seated to the right of the Alumni Association president who is in the red jacket. A young son and his mother were surrounded by love at a Forest Lawn memorial service for their firefighter father and husband who passed unexpectedly. 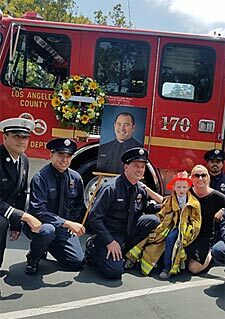 The LA County Fire Department did an outstanding job of supporting the family and honoring his service, and will no doubt continue to do so well into the future. Cherry was honored to have been asked to make a memorial wreath for the service featuring the family's favorite sunflowers. She did not know until later that the wreath was taken from the service and displayed on the fire truck so a group picture could be taken. This will be a treasured picture in Blossoms by Cherry's studio. The Valley Industry and Commerce Association (VICA) annually holds a Hall of Fame dinner honoring five iconic San Fernando Valley businesses and organizations that have contributed to the Valley's rich history. One of those recent honorees was Tapia Brothers Fresh Produce who has operated an open-air produce market in Encino, CA. for three generations. 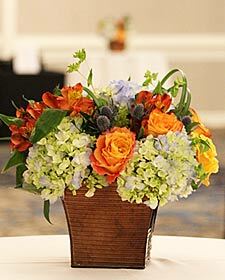 Blossoms by Cherry was tapped by VICA to provide the centerpieces for the awards dinner with a special request to incorporate fruits or vegetables to further honor Tapia Brothers. 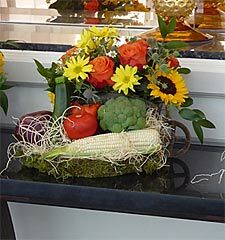 The resulting 35 centerpieces were a unique combination of colorful summer harvest-look flowers in a small wooden wheelbarrow and the finest and freshest Tapia vegetables including corn, broccoli, tomatoes, beets, zucchini and peppers. Cherry purposefully did not glue or treat the vegetables with any floral product so the guests taking the centerpieces home not only had flowers to enjoy, but fabulous vegetables. Thank you, Tom Tapia and brothers. After Blossoms by Cherry recently joined the Valley Industry and Commerce Association (VICA), the organization's leaders invited us to provide flowers for many of their business events. In just a year we provided flowers for their December Annual Meeting, the Annual Business Hall of Fame Dinner, The Local Officeholders Luncheon and the Business Forecast Conference. VICA is considered one of the most influential business advocacy organizations in Southern California. With its knowledge of the legislative process and economic issues, VICA's access to public officials ensures that the San Fernando Valley's business perspective will be heard in the interest of improving our business climate and quality of life. We are thrilled to be working with VICA and thank them for their confidence in our work. Not only is it fun to provide centerpieces and podium pieces, it is a great to actually attend the events to learn more about what it takes to improve the business environment in the San Fernando Valley. We have met any interesting and thoughtful business people and have learned a lot. Thank you VICA. It is hard to believe that 100 years ago, there was a Northridge Chamber of Commerce already up and running. The occasion was celebrated in August 2017 at Rancho de Cordillera in Northridge which is one of the few old ranches left in the area. Blossoms by Cherry designed and sponsored the centerpieces and general décor. A western theme was selected to speak to the rich history of horse ranches in Northridge, many owned by movie stars. For each table Cherry and her team designed a tabletop, featuring hay, a cowboy hat, bandannas, rope, sheriff badges with mason jars and daisies topping it off. 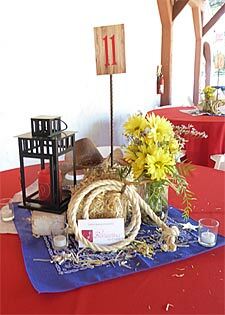 The table numbers were placed on hand-rusted rebar that went right into the hay bale. The décor set the tone for a fun and relaxed 100th birthday party at a lovely ranch. 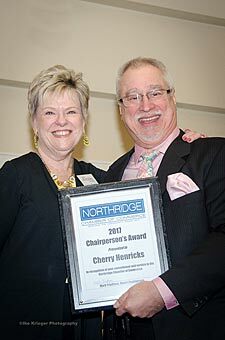 Cherry Henricks was recently honored to receive the Northridge Chamber of Commerce Chairperson's Award given to the board member making the most outstanding commitment to the Chamber in the prior year. Cherry was part of a small team that worked with California State University Northridge to form a Chamber networking group to bring together CSUN supporters and showcase the best the campus has to offer, including available world class business services, often at no charge. As a result, the group also discovers ways to more personally engage with CSUN and support its mission. A large percentage of Northridge Chamber members are CSUN graduates or are closely connected to the University and are anxious to learn more about CSUN and make connections. CSUN has much to offer to the community and is very proud to open up the campus to the Chamber members and University friends. Cherry is a CSUN graduate and also serves as the vice-chair of the CSUN President's Associates, an organization of annual donors who enthusiastically serve as ambassadors for the University. Cherry Henricks is pleased to announce that she is beginning her tenth year of providing flowers for Cal State University Northridge. 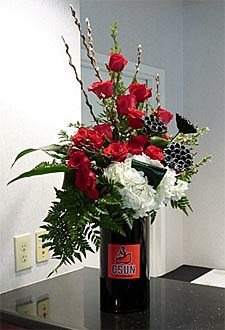 Cherry's duties include providing flowers for events at the CSUN Orange Grove Bistro, also known as the University Club, the faculty lounge at the Sierra Marketplace, The Valley Performing Arts Center (The Soraya) and The Northridge Center as well as other events held on campus. Among these events are graduation celebrations, the Volunteer Service Awards, the Staff Service Awards, the Athletic Hall of Fame Banquets, Alumni and Business School Scholarship dinners, Founder's Day, and the Nursing Department's 20th Anniversary celebration. Cherry's favorite is always the lovely luncheon given by President Dianne Harrison to thank University donors. 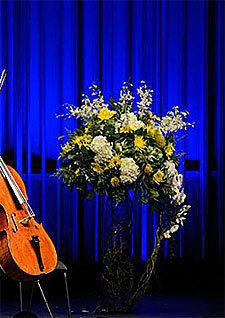 Her biggest thrill was making the stage flowers for Yo Yo Ma's benefit performance for the Valley Performing Arts Center. Cherry is proud to be a Matador herself. 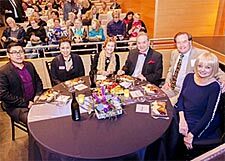 In May 2015 for YoYo Ma's gala fundraising concert at the Valley Performing Arts Center at Cal State University Northridge, Blossoms by Cherry was honored to be asked to provide the stage flowers. Two tall, flanking arrangements in colors of yellow, green and white were requested by the gala staff to complement and contrast with the blue background lighting without overwhelming Mr. Ma's stage presence. "It was an amazing honor to be selected to do the stage flowers for such an important event for CSUN and for such a world class musician. I was fortunate enough to attend the event and kept pinching myself during the concert as I looked from Mr. Ma to my flowers during the concert. It was a truly magical evening and one not soon to be repeated," said Cherry. On a recent trip to visit family in Quemado, New Mexico I was struck by the abundance of wildflowers everywhere. As a florist I could not help myself and asked my sister-in-law to take me out in her Polaris RZR so I could pick some for an arrangement yet to be determined. Turns out she didn't have a vase but had tons of Mason jars and so I got the idea of tying them together with a piece of found wood from their property. However, when it came to wire to put it together the only option was to cut wire off the bales of hay used for their horses. I had such a fun time and was glad I had lots of Benadryl with me as pollen was flying everywhere. I has the satisfaction of proving that improvisation often yields the best results. Pinterest, here we come! Cherry Henricks thought it was a joke when a producer from American Idol called in December and asked for 10 floral arrangements. Idol is one of the few TV shows Cherry watches regularly so she assumed a friend was trying to put one over on her. Not so. The producer was real and wanted Blossoms by Cherry to provide floral arrangements for the judges' dressing rooms and private dining areas while Idol was filming "Hollywood Week" at California State University Northridge. Cherry delivered the 10 florals the first day of filming and promptly got an order for 10 more for later in the week, plus an appreciated invitation to watch the filming at CSUN and again at the main studio later in the season. The producer told Cherry everyone was fighting over who got to take the flowers home once "Hollywood Week" was over. 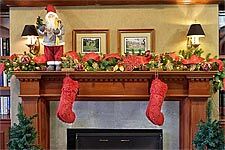 This year we continued providing holiday decorating to our roster of services with our most repeat client being Aegis of Granada Hills, an upscale assisted living facility. After seventeen years of operation, Aegis decided to retire their old decorations in favor of an all-new look. This service came about not only because Aegis was ready, but because we knew our combined expertise in floral and interior design would make us good at it. We have always been asked by our clients for advice on how to use their existing decorations in conjunction with our floral arrangements. Or, they asked us for a few unique things to enhance the overall presentation because they knew we had access to so much more than they generally find in retail stores. Then they asked us to install it all, thus a full holiday decorating service was launched and continues. The Aegis residents love fun watching us decorate their lovely home and often help us put ornaments on the gorgeous 12-foot lobby tree in honor of their loved ones. Together with smiling faces and great holiday music, it is always a fabulous kick-off for the season ahead and the continuation of this specialty service. 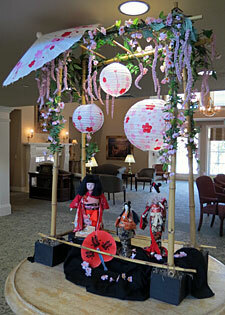 An upscale assisted living facility in the San Fernando Valley, Aegis of Granada Hills, has asked Blossoms by Cherry for assistance in providing highly-themed floral displays for their monthly around-the-world themed dinners attended by residents, their families and members of the local community. Past dinners have featured China, The Philippines, Cambodia, Ireland, Mexico, and Australia. Blossoms by Cherry also supplies bi-weekly florals for the dining room as well as lobby florals for all holidays in addition to special events and parties held at Aegis. We were excited to learn that our flowers for the Glendale, CA wedding of Alexis Kinney and Josh Waidley were featured on the wedding blog stylemepretty.com. The blog writers select only those weddings with unique details to inspire future brides. This late afternoon/evening wedding was held at the magnificent Los Angeles River Center (formerly the Lawry's California Center) and took advantage of several outdoor locations on the site. The ceremony was under the canopy of a magnificent oak tree, the cocktail reception on the adjacent lawn and dinner and dancing for 200 on the courtyard and gardens surrounding the feature fountain. We were asked to move our floral from site to site as the party progressed. The bride wanted us to interpret her desire for a Marie Antoinette-inspired French garden theme while incorporating the soft colors of lavender, pink and yellow with feather and bird accents. 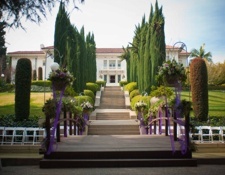 We were saddened to learn that the wedding we did for Erica Spalding and Justin Jackson wedding was one of the last events to be held at the historic Merritt Mansion and gardens at Ambassador West in Pasadena, CA. The gorgeous mansion and gardens were closed shortly after their wedding due to changes in ownership and neighborhood land use concerns. Erica and her family picked this fabulous location because it offered the informality of a garden wedding as well as the formality of a sit down dinner inside the celebrated mansion under the signature crystal chandelier ….the best of both worlds according to Erica! We designed European-style hanging florals for the in-the- round wedding held on a bridge over the pond in the garden and later moved them to the dinner reception. There must have been 125 steps up between the wedding and the reception and hauling all the flowers from one place to the other gave us our exercise for at least a month! We enjoyed the gardens and got in shape at the same time. Copyright © 2019 - BLOSSOMS BY CHERRY, All Rights Reserved.